​Scott and I are recreational mushers who last year completed our fourth winter running Alaskan Malamutes. Over the course of those four years we have learned an incredible amount about running dogs through reading, talking to other mushers, and the inevitable trial and error. We first met Jamie Nelson, Iditarod finisher and reigning Beargrease champion, at a seminar sponsored by the Tri-State Alaskan Malamute club. Jamie shared her knowledge liberally throughout the course of the weekend, and during that time two things became obvious: we had good dogs with faults which could be corrected through training, and Jamie had information and skills we could benefit from. Jamie's "let's do it!" attitude stuck with us throughout the course of last winter and on into spring. 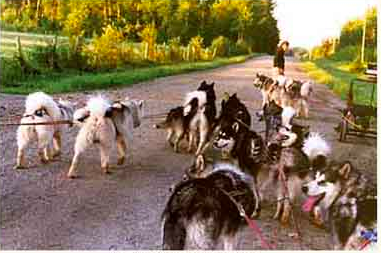 Wanting to learn more, our good friends Jan and Sandy Hagan and their team of 14 malamutes and Canadian Inuit dogs, and Scott and I and our team of 11 malamutes and Inuit dogs spent five days at Jamie's home in Togo, MN taking "mushing lessons." Here are some of her basic principles which any musher can employ. Probably the most important thing we learned from Jamie was to train slowly. Running dogs and training dogs are two totally different things. Too often in the enthusiasm and frenzy of the moment we let our dogs run all out at the beginning of a run. Sure it's fun for the first half mile or so, but it's a good way to frighten young or uncertain dogs, and our experience is that the team's chances of "breaking down" (slowing way down, stopping to pee, slacking off in harness, etc.) increase exponentially after a take-off which is too fast. When you start out slowly the dogs have to really concentrate to pull the vehicle down the trail. This gets their minds into the game from the start. When a dog is concentrating on pulling, it's not getting in trouble. With overly fast starts, once a dog's initial enthusiasm to run wears off and it isn't thinking about what it's doing, behavioral problems can follow. OK. So training slowly is a great theoretical idea, but just how do you get a team of rarin'-to-go sled dogs to leave the starting gate under control? While we were at Jamie's we trained with both 4-wheelers and three-wheeled carts. If you're training with a 4-wheeler (and this is definitely the way to go if you can afford one), the speed the dogs go is controlled by the gear in which you idle the 4-wheeler. During a take-off, when you want the dogs to buckle down, pull hard, and think about what they're doing, we often start in 2nd gear. Since the take-off from our driveway is down a rather steep hill, at home we sometimes start in 1st gear to try to maintain control. We then oscillate between 2nd and 3rd gear for most of the run depending on terrain, number of dogs in the team, etc. If you aren't fortunate enough to own a 4-wheeler, the same thing can be accomplished with a training cart. Without the benefit of a heavy vehicle and gear mechanisms to control the team, you just can't train as many dogs at once. In place of downshifting, you use the brakes--liberally! You don't want to apply so much brake that the wheels are locked up, but in the beginning you want a lot of resistance so the dogs start to think and know that you are in control. It is better to over-do the brake a little at the beginning than to let them go out too fast. Another way to create resistance is by attaching an old tire to your cart and dragging it behind you. This gives your cart no coasting ability so it won't continue to roll forward if the dogs aren't working. Slow training allows the dogs to concentrate on moving the vehicle--on pulling. This is a critical concept for sled dogs. We know many dogs (some of them ours!) who like to go great guns as long as the going is easy, but at the first sign of resistance (poor trail conditions, hills, fatigue) they quit. When the going gets tough and they begin to notice the tug on their harnesses they slack off, turn around and look at you, or start playing with their neighbors. These dogs are willing to participate when the going is easy, but when they're really needed they abdicate their responsibility to the rest of the team. How many times have you gotten to a large hill only to have your dogs slow down, stop, then turn around and look at you as if saying, "Well, are you going to get off and help us or what?!" If you're like us, you probably felt sorry for your hard-working (and sometimes manipulative) dogs and helped them up the hill. In other words, you inadvertently rewarded them for being lazy and quitting. Jamie advocates making the dogs work harder as the going gets harder if they start to quit on you. When they start to quit, she taught us to down-shift the 4-wheeler or apply more brake to the cart so the team--everybody--really has to pull to get it up the hill. If they slow down even more with the increased resistance, you can try vocal commands or your jingler to encourage them to dig hard. If that doesn't work, you may have to get off your cart or sled and reprimand each and every dog on the team with a snap on their tuglines or a thump of the jingler. Once they see that you are serious about them pulling through the difficult spots, they generally respond with renewed enthusiasm. Don't forget the praise when they overcome a difficult hurdle. They will know they have done well, but it doesn't hurt you to tell them too! A dog team isn't one or two good dogs with a lot of strength and attitude leading on a bunch of sightseers. It is two, four, six, eight, or more dogs all pulling and doing their share of the work. If the dogs stop when the going gets rough, then the whole team gets a correction. It is a team responsibility to keep the vehicle moving forward, and if that isn't happening, it's everybody's fault. The way we correct for this is by running up behind the dogs and pulling backwards on their tuglines and then releasing them thus snapping them forward with a stern "Everybody pull!" We make our way forward through the team correcting each dog in this way with the lazier dogs getting a more severe correction than those who are doing their best. Once we are at the front of the team we say, "Now everybody pull!" and almost invariably they take off with vigor. Those who were slacking decide that it really wasn't the appropriate time to be resting, and those who were pulling are happy to have the additional help. It doesn't take long before the dogs learn to pull harder when the resistance kicks in, and usually just a vocal reminder will get even a slacker to remember his or her job. Set them up to fail--and then to succeed! One of the things we malamute people do (or at least many of the malamute people who I run with) is to avoid problems at all costs. This severely limits the types of experiences we can have with our dogs. I am terrified of dog fights and have spent the last four years dreading to pass or be passed unless the team being passed was pulled off into the woods somewhere and the passing team was led past by the musher. Even then most passes have left me shaken. I didn't trust my dogs to go on by without incident, and I didn't trust myself to be able to handle a problem should it occur. If I ever did pass successfully (a "successful" pass was defined as one without any aggression) then my dogs would slow to a crawl and expend much more energy looking at the team in back of them than they would expend going forward. I knew this was an area my team needed work on, but there was no way to practice passing because that would entail intentionally setting up a situation where problems could occur--something that I thought was fundamentally wrong. Not so. On our first morning with Jamie, Scott and I hitched seven dogs to one of Jamie's 4-wheelers and Jan and Sandy hitched ten dogs to the other of her 4-wheelers. I was stressed to begin with with such large teams on the road, but the pressure really rose when Jamie called to Hagans and motioned them to pass us. Our team slowed down, theirs sped up, and the first pass was completed successfully with a lot of "on bys" and three of us running interference between the two teams. Then Jamie told us to relax for the next pass, to tell the dogs to "on by," to stay on the 4-wheelers, and to let the dogs know we trusted them. (Jamie was kind enough to get off so she was available to deal with any problems which might--but did not--occur.) We practiced passing again and again over the course of the five days we were with her, and we never had more than a small incident here or there--even when we got four teams on the road and were passing three teams abreast. By being ready to confront problems immediately either vocally, with the rattle of a jingler, or with a swift thump on an offending muzzle if it was nosing in the wrong direction we were able to maintain the level of discipline necessary for the type of work we were doing. Our confidence, along with our dogsâ€™ confidence, rose with each successful pass. Five days were not enough for me to confidently boast that my dogs can pass (or be passed by) any team at any time without incident. It was enough time, however, to show that through consistent, persistent training, our dogs are capable of learning and developing the confidence to perform well in previously stressful situations. Make training more stressful than your "goal." Finally, do your homework ahead of time. Too many times we set up a goal for ourselves and our dogs (a camping trip, a race, a tough run), but we fail to prepare them for that goal. That is exactly what happened with us last winter. The first day of our 65-mile camping trip went great--everyone worked, everyone took commands, and there was a feeling of "team." However, one of our best leaders started showing signs of stress on the second day, and by the third day he was no longer leading, only occasionally pulling, and more than ready to take out his frustration on his brother. The last seven miles out on the fourth day were no fun with an unpredictable dog on an icy trail. What happened? We had never asked him for that level of performance over an extended period of time, and he (and we!) didn't know how to deal with the stress. Jamie says that the training should be more stressful than the "goal." In her case, she says her dogs think they have gone to heaven when they finally get to run a marathon race because their training regimen is much more stressful than the race itself. The same principles apply to us recreational mushers. By setting up situations, distances, and conditions equal to or worse than you expect to encounter, you can see how your dogs are likely to react, and you can devise a training method appropriate for the situation. If the training has been done correctly, the dogs (and you) will have learned to cope with many stressful situations during training and thus have the coping skills necessary when it really matters. Your "goal" will therefore be much more enjoyable for both you and the dogs. Enjoy your dogs and be proud of what they can do! 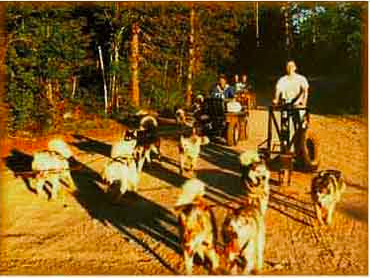 With slow, controlled training in which you, the musher, are in control, your dogs will develop the discipline necessary to go above and beyond where mere enthusiasm will take you. Your dogs will learn to pull, and to pull hard; they will learn that pulling is a team effort, and they will work together to get you down the trail. We're not worried about speed because we run freighting dogs, but this method can work for you even if you like to go fast. Once they really learn how to pull, you'll be amazed at how their performance will improve when you let up on the brake. Whatever it is that you want your team to be able to do, set up a situation to teach them the skills they need to have in order to do what you want. During the training process, you have to anticipate problems that may occur and be ready to deal with them effectively. Remember that training is hard work for both you and your dogs. It will take miles and miles of repetition, correction, and praise before some lessons will be learned. However, the reward will be there. Set a goal for your team--whether it be getting your first two-dog team to the end of a hilly four-mile trail or having your favorite dog single leading across a trail-less lake in the Boundary Waters--and work toward that goal. Don't let anyone tell you that you or your breed can't do something. Jamie encouraged us to decide what we wanted to do with our dogs (as opposed to what we thought the dogs could do, or what other people told us our dogs could--or couldn't!--do). As a result we have "big" plans for this coming winter with our freighting dogs. Remember, the hours spent training are designed to help you and your dogs enjoy your time on the trail even more so get out there and have a "can do" attitude! a 500-mile sleddog race held every January in Minnesota. Named after John Beargrease, an Ojibway (Chippewa) Native American who carried the mail by dog sled, the race runs from Duluth to Grand Portage (on the Canadian border) and back to Duluth. a noise-making device, usually bells or washers on a ring or rope. The noise made by the jingler accompanies a correction. a command used with dog teams to tell them to go on by an obstacle or a distraction. In other words, don't slow down -- keep going. one dog as a single lead dog. The alternative to a single lead is a double lead, where two dogs run together at the lead position. a large protected wilderness region in northern Minnesota on the Canadian border. It has a multitude of connected lakes, and is a favorite of people seeking the solitude of the north woods. Banner: "Winterstar Team." Owned by Tim O'Brien and Karina Burger.